Introducing Sekiro: Shadows Die Twice, a fantastical, dark and twisted new gameplay experience from developer FromSoftware, creators of Bloodborne and the Dark Souls series. Directed by Hidetaka Miyazaki, and published by Activision, Sekiro: Shadows Die Twice is a third-person, action-adventure game with RPG elements. The single-player game puts players in the protagonist role of a hard-hearted warrior whose mission is to rescue his master, a young lord who is the descendant of an ancient bloodline, and exact revenge on his arch nemesis. 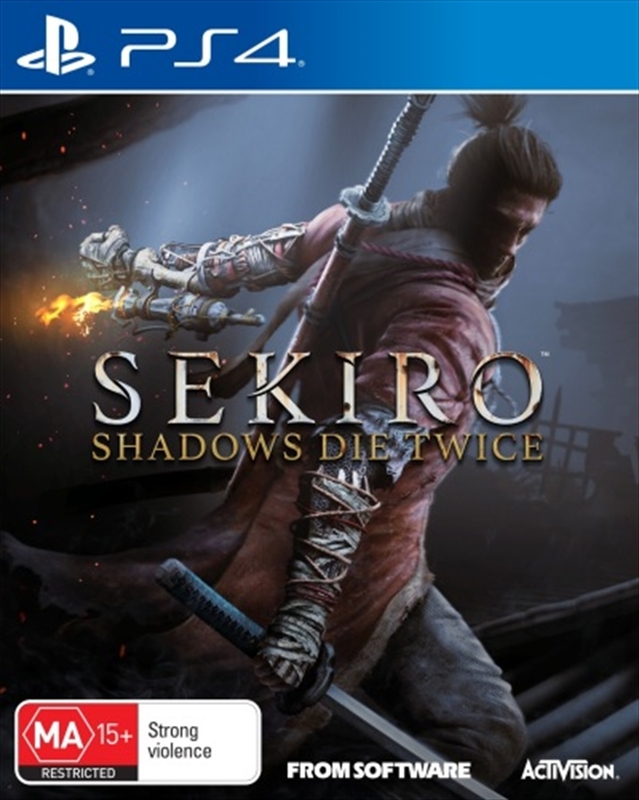 Set in the re-imagined world of late 1500s Sengoku Japan; a brutal, bloody period of constant life-and-death conflict, in Sekiro: Shadows Die Twice you are the "one-armed wolf," a disgraced and disfigured warrior rescued from the brink of death. In the game, players come face-to-face with larger than life foes; unleash an arsenal of deadly prosthetic tools and powerful ninja abilities to blend stealth, vertical traversal, and visceral head-to-head combat in a bloody confrontation. Take revenge. Restore your honour. Kill Ingeniously. Kill Ingeniously - FromSoftware delivers their best in class combat in this fast-paced, action-adventure game featuring all new mechanics. Exploration is key - Players will experience the thrill of exploration and discovery in Sekiro: Shadows Die Twice like never before. Through exploration, players can uncover new items, meet new characters, and encounter hidden enemies. Armed - Sekiro: Shadows Die Twice gameplay is centred around sword combat, enhanced by a variety of prosthetic arm attachments that supplement or change the way a player fights. Achieving strategic mastery of "Sekiro" or the "one-armed wolf's" techniques and abilities, from prosthetic tools, swordplay to stealth and the grappling hook is no easy feat. To overcome difficulties and bring each situation under control, gamers must discover, integrate and use a variety of new tools when heading into combat. One-armed wolf - Play as a highly talented shinobi in the service of a young lord raised in isolation. After suffering defeat at the hands of a shadowy Ashina samurai seeking the unique heritage of your master, the two of you are separated. Deep in the mountains, in a dilapidated temple, you reawaken to your fate. You must take back your master and exact revenge on your enemy at all costs. Hard to the core - Sekiro: Shadows Die Twice is a hard-core game worthy of the name FromSoftware. Miyazaki designed Sekiro: Shadows Die Twice this way! Fans of FromSoftware will find the gameplay challenging, yet fun and rewarding. The quality of combat, level of challenge, and creative enemies and bosses are something that can only be found in a FromSoftware title. Reimagined world - This reimagining of Japanese aesthetic blends a withered, yet vivid, world of the late 1500s Sengoku Japan as the age of warring states nears its end. Witness a world brought to its knees by constant bloodshed; a ravaged world on the brink of destruction. Explore these environments, rich with FromSoftware's intricate design and steeped with secrets to discover. Larger than life enemies - Sekiro: Shadows Die Twice features fantastical fearsome enemies and bosses. Players will battle with larger-than-life enemies that will test their mettle in a variety of situations. From hidden enemies to discover to 3D combat, the quality of creative enemies and bosses are something that can only be found in a FromSoftware title. - Sekiro: Shadows Die Twice is a hard-core game worthy of the name FromSoftware. Miyazaki designed Sekiro: Shadows Die Twice this way! Fans of FromSoftware will find the gameplay challenging, yet fun and rewarding. The quality of combat, level of challenge, and creative enemies and bosses are something that can only be found in a FromSoftware title. Larger than life enemies - Sekiro: Shadows Die Twice features fantastical fearsome enemies and bosses. Players will battle with larger-than-life enemies that will test their mettle in a variety of situations. From hidden enemies to discover to 3D combat, the quality of creative enemies and bosses are something that can only be found in a FromSoftware title.